What is an Investment Calculator? Investment calculators help you determine whether investing in a particular stock is a good idea or not. One of the most difficult aspects of investing is knowing exactly how to value a business and figuring out if a stock is at a good price to buy. These calculators take the guesswork out of investing on your own. Why Use an Investment Calculator? you’re buying a stock at a good price, investment calculators can still provide you with valuable information. For example, our retirement calculator will determine exactly how much you need to retire so that you can live comfortably through your retirement years. It factors in the cost of your lifestyle, expected rate of return, and the years you have left to save before retirement to give you a personalized goal number. 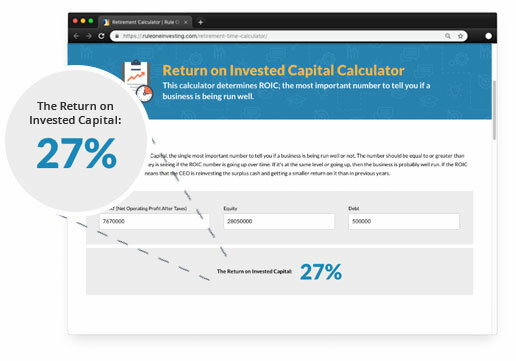 Our Sticker Price and Margin of Safety Calculator will help determine how much a company is worth, and how much you should buy it for based on its true value. Sometimes stocks sell for much more than they’re worth. Sometimes, they’re priced much lower than their true value. This calculator tells you if you’re getting a good deal when you buy their stock. Rule #1 investing is based around some very specific calculations that help paint a picture for how a business is being run, if a stock is selling at the right price, and how long it should take you to make your money back when you invest. Of course, these calculators should not be the only area you look at when you’re thinking of investing in the stock market. First, you need to fully understand the company and ensure that it matches your values. Second, make sure it has a durable competitive advantage. Third, make sure it’s run by honest people. After that, use our handy investment calculators to help you with the rest. This calculator determines ROIC; the most important number to tell you if a business is being run well. EPS is one of the Big 5 Numbers required to determine whether a company is a wonderful business. The point of this calculation is to see if the operating cash flow trend is predictable in a business. This calculates the rate a company has grown its Equity, or Book Value Per Share. This calculator determines the rate at which a company has grown its sales. Use this calculator to determine if you can buy the company safely to make a 15% return over a 10 year period. This calculator determines the number of years it would take the earnings of the company to cover the cost of the stock price you paid. 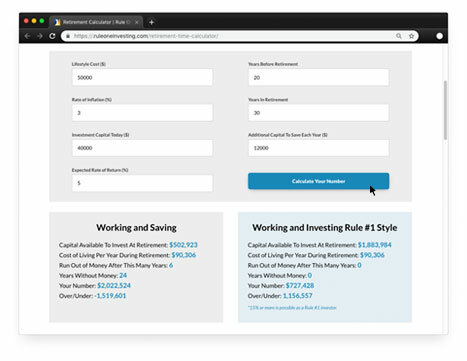 This calculator determines your future annual cash needs, annual savings needed and total future savings. This spreadsheet will help you lay out the calculations needed to determine the payback time for a business. These are the functions behind Phil's calculations; follow the explanations to set up your formulas in an Excel spreadsheet.